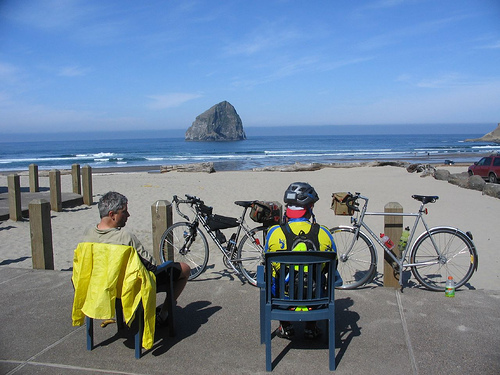 Special Note for 600K riders: Fee includes accommodations at the Travelodge on Sat night. Two randos per bed. We will also be feeding you before you sleep and after you wake and start day 2. We will have 1 room on Sunday afternoon for checkin and to take showers before you travel. If you want your own room contact Shilo Inn 503.537-0303 (1/2 mile west of Travelodge). There are no individual rooms available at this late date at the Travelodge for Friday or Saturday. PLEASE DO NOT ASK FOR ONE OF THE CLUB ROOMS FOR SATURDAY NIGHT!!!! Please register before Friday morning or you will not be receiving preride email. Please register before Friday morning... or you might find sleep space only on the floor. 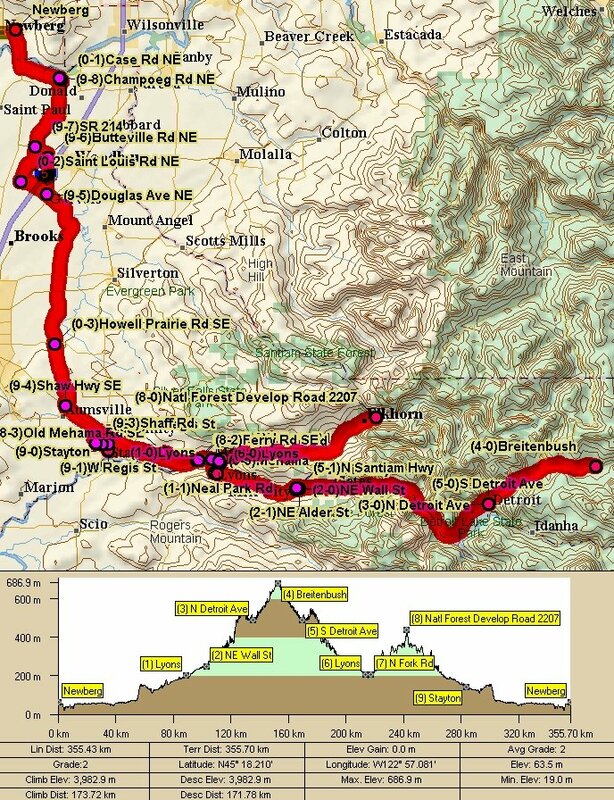 The route starts just north of the Willamette River in Newberg and heads south across the French Prairie towards Aumsville then East on Hwy 22 to Mill City and Detroit Lake. From Detroit Lake you climb to Breitenbush Hot Springs turnoff and return downhill to Detroit. Return to Lyons and then ride a rolling out and back to Elkhorn. This is a very quiet valley that goes nowhere. 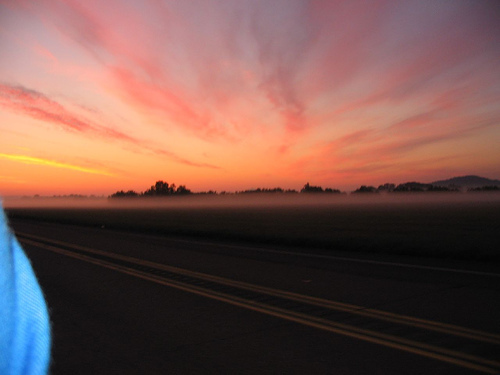 After visiting nowhere, you return to Newberg via Howell and French Praries. Day one is approximately 360K (225M). 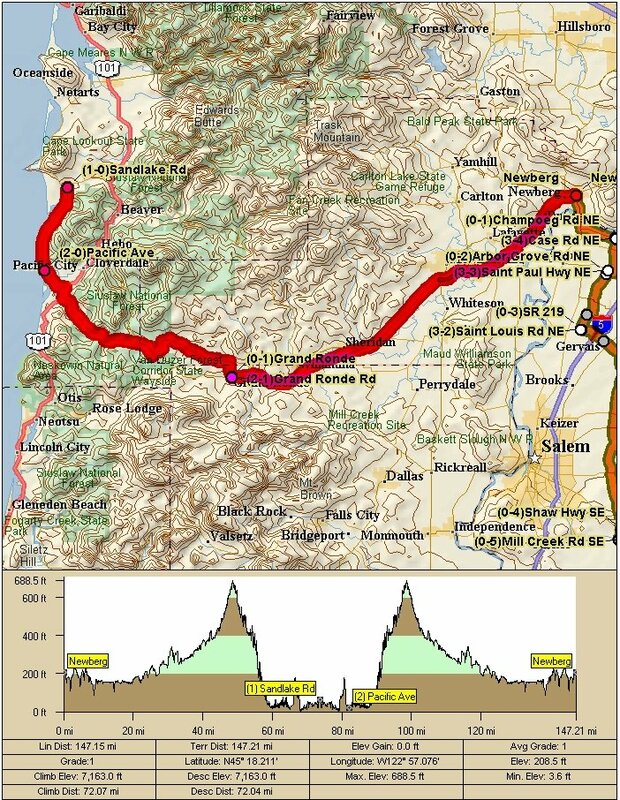 Day 2 of the route travels to Amity, Ballston, Willamina to Grand Ronde, then Northwest on the Little Nestucca Hwy to Pacific City, then north along the coast to Sandlake Dunes. Turn around and return the way you came to Newberg. 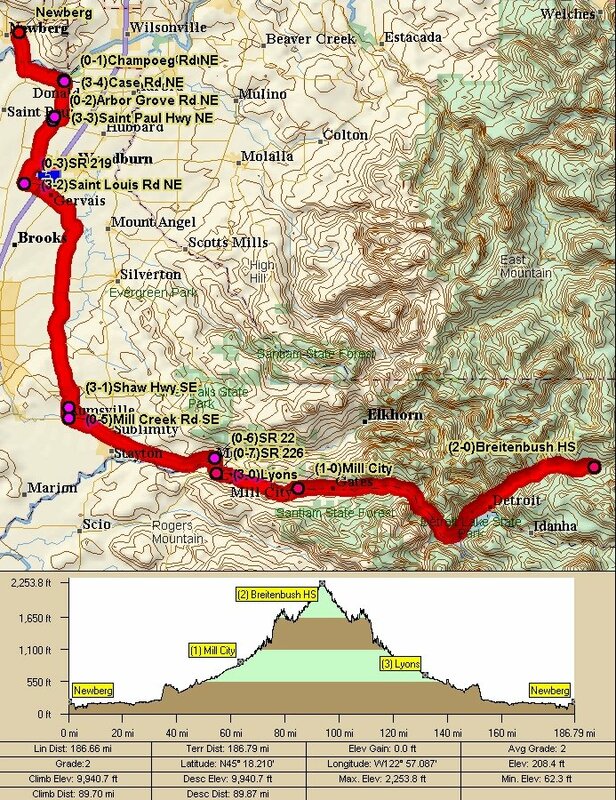 The event starts with the 600K you'll follow the same course as far as Breitenbush Hot Spring (elev ~2100, 150K). Turn around and return the way you came back to Newberg. If you are fast you might get sucked into the 360k version of this 300k if you've been riding in the company of 600k riders... It is a trip to Elkhorn, see the 600k description.